Artistic Detachment in Japan and the West takes up the notion of artistic detachment, or psychic distance, as an intercultural motif for East-West comparative aesthetics. 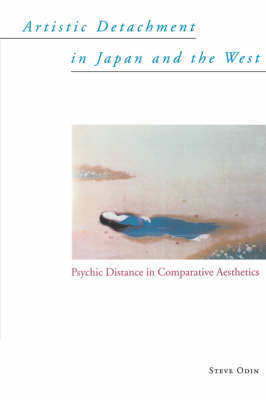 The work begins with an overview of aesthetic theory in the West from the eighteenth-century empiricists to contemporary aesthetics and concludes with a survey of various critiques of psychic distance. Throughout, the author takes a highly innovative approach by juxtaposing Western aesthetic theory against Eastern (primarily Japanese) aesthetic theory. Weaving between cultures and time periods, the author focuses on a remarkably wide range of theories: in the West, the Kantian notion of disinterested contemplation, Heidegger's Gelassenheit, semiotics, and pragmatism; in Japan, Zeami's notion of riken no ken, the Kyoto School's intepretation of nothingness, D. T. Suzuki's analysis of the function of no-mind, and the writings of Kuki Shuzo on Buddhist detachment. Portrait of the artist fiction by such writers as Henry James, James Joyce, Mori Ogai, and Natsume Soseki demonstrates how the main theme of detachment is expressed in literary traditions. The role of sympathy or pragmatism in relation to disinterest is examined, suggesting conflicts within or challenges to the notion of detachment. Researchers and students in Eastern and Western areas of study, including philosophers and religionists, as well as literary and cultural critics, will deem this work an invaluable contribution to cross-cultural philosophy and literary studies.